Sherry"s Stamped Treasures: What's Happening in August? Welcome August! With the arrival of a new month, comes with it lots to share and this month is an especially busy month. So much going on, be sure to read all the way through! Please note: The Watercolor Pencils are sold separately - they are not included in the bundle. View the Color Your Season Promotion details. I am LOVING our new alcohol markers - Stampin' Blends - and I know many of you are loving them too! With the release of the new catalogue came 11 new colors and with the upcoming holiday catalogue, there will be another 6 new colors! If you are anything like me, you want them ALL! 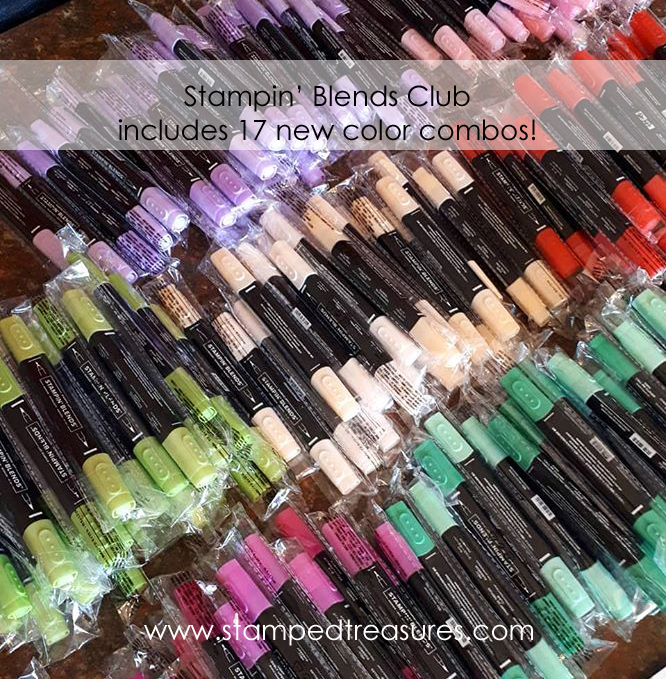 But that can be a bit of a commitment so I've decided to offer a Stampin' Blends Club. It really is the BEST way to get them all - along with some freebies! 1. Club will run for 4 months (August - November). It's time for another round of Bonus Days! For every $60 you spend between August 1st and 31st you'll receive an email with a $6 coupon code that can be used on orders placed in September! Woohoo! Use this host code when you shop online with me during the month of August and I'll send you a free gift and a handmade card with your $50. Note: don't use the host code with any orders over $200 as these qualify for Stampin' Rewards!